Our luncheons feature an "Advancing Fund Development" session at 10:30am covering an educational topic in a classroom style interactive lecture followed by a Luncheon session at which there are self-introductions of all attending and an educational/informative talk delivered by a speaker. All content from AFP Orange County is approved for earning credits toward a CFRE certification. Webinars are a group exercise where fundraisers gather to listen to a professionally presented discussion on a topic of interest that is followed by a roundtable discussion by local professionals. 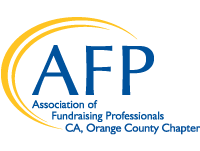 AFP Orange County webinars are held at the offices of OneOC, 1901 East Fourth Street, Santa Ana, CA 92705. There is NOT an option to listen at your office or other location. Dates: Second Friday of every month. 11:30 a.m. - 1:00 p.m. Bring a lunch and join in! Candidate is a member of the Orange County Chapter of AFP. Candidate is employed as a fundraising professional or, if candidate is an executive director, a substantial amount of time must be devoted to fundraising. Candidate has never attended an AFP International Conference on Fundraising as a registered participant (unless as a member of the Conference Host Committee). Candidate agrees to complete and return an evaluation form to the Scholarship Committee and prepare a one-page report for the AFP Board of Directors about his or her experience. The scholarship covers the registration fee for the conference plus up to $1000 for air and hotel costs. The Chamberlain Scholarship program honors Ralph E. Chamberlain, CFRE. Mr. Chamberlain had a long and distinguished career of service to the Association of Fundraising Professionals (AFP), beginning in the 1960s when the organization was formed as the National Society of Fund Raisers (NSFR), through the late 1970s when the name was changed to the National Society of Fund Raising Executives (NSFRE), and until his death in 1999. Mr. Chamberlain helped to form one of the organization’s earliest chapters, today known as the Greater New York Chapter. He served as the fourth chair of the NSFR Board of Directors from 1967-1969 and as chair of the NSFRE Foundation from 1982-1985. Most of Mr. Chamberlain’s fundraising career was spent with The Salvation Army, serving many years as the director of development and director of the National Information Service. He was also founder and chairman of the board of Precise Kit Promotions Inc., a manufacturer of disaster aid kits for private and government agencies. A deeply committed philanthropist and volunteer, Mr. Chamberlain devoted much of his time to education, health and arts programs and causes. He served on the board of Hartwick College (Oneonta, N.Y.), Hassett Healthcare (Cooperstown, N.Y.), Glimmerglass Opera (Cooperstown, N.Y.), the Farmer’s Museum (Cooperstown, N.Y.), the Bergen County, NJ 200 Club and the Do-er's Club of Bloomingdale, NJ. He frequently helped those organizations with their fundraising campaigns and other activities. A music lover himself, Mr. Chamberlain played the trombone with a professional orchestra in Syracuse, NY. Mr. Chamberlain’s dedication to the organization we now know as AFP never faltered in his long volunteer career with the Association. Because of his long-time support of the Foundation’s annual fund and generous planned gift, the AFP Board of Directors renamed their Conference Scholar Program in 2000 to honor Mr. Chamberlain’s memory and commitment to the Association.